Rheumatoid arthritis (RA) therapy in the UK is standardized by the National Institute for Health and Clinical Excellence (NICE). To be eligible for anti-TNF therapy RA patients (pts) must show inadequate response to 2 synthetic DMARDs (including methotrexate [MTX]) and high disease activity (DAS28>5.1). To continue therapy pts must show a change in DAS28>1.2 at 24 weeks (wks).1 Certolizumab pegol (CZP) studies in RA have shown the majority of pts respond by Wk 122,3, and response at 12 wks is predictive of clinical outcome at 1 year2-4. Continued CZP therapy should be carefully reconsidered in pts who show no therapeutic benefit in the first 12 wks5. In the UK, CZP is available via a Patient Access Scheme (PAS), which provides the first 12 weeks of CZP free of charge. This analysis examines persistency and actual versus potential cost savings realized with a 12 wk decision with CZP. This retrospective analysis used anonymised data from Healthcare at Home (HAH), the UK’s largest home healthcare service provider. A crude unadjusted persistence rate was calculated for pts receiving CZP between March 2010 – March 2012. Persistence was defined as the percentage of pts continuing to receive deliveries of CZP with pts censored according to the date of first delivery. Treatment start was first delivery date and treatment status was determined as current or finished at specified time points (13, 26, 39, 52 weeks). Pts were defined as naive or switch (≥1 prior anti-TNF, according to HAH records). Pts who temporarily discontinued therapy were excluded. A cost analysis was performed by calculating a) the savings from the PAS and b) the potential reinvestment which could be made by removing non-responders at 12 wks versus 26 wks. This analysis included 2,737 pts receiving CZP (mean age 57 years). 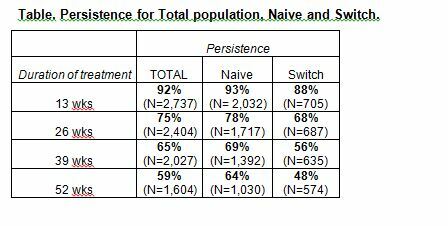 At 52 wks, the persistence rate was 64% in anti-TNF naive and 48% in switch pts (table). Analyzing first-line biologic drug costs only, the NHS would save £2,363.14 per pt in the first year if CZP were used in place of adalimumab, assuming similar persistence rates; largely due to the PAS. Stopping treatment for non-responders at Wks 12 (CZP) vs Wk 24 (adalimumab), could allow the UK NHS to re-invest £ 2145 per pt whilst avoiding unnecessary drug exposure. In this UK cohort, CZP persistence was 64% at 52 wks in naive pts. 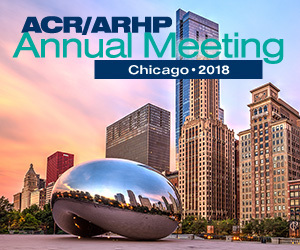 Reinforcing a 12 wk treatment decision could result in more efficient spend on drugs as well as avoiding unnecessary drug exposure and delayed initiation of alternative treatment in non-responders.